One of the nice things about finally having a date was going to someplace I had not been before, with a person I had not met before, and with a waitress that was already celebrating the Gay Pride Parade. Besides the Tuesday special, the menu had many different items on it, beginning with “Starters” for $2 and going to Salads and Wraps, Entrees, Sides, Taco’s and Burritos, and ending with dessert. The waitress, who’s name I will not mention to protect the innocent, was a very attractive young lady with a proclivity to stroke either my arm, my leg or my back every time she walked by me. Although not sexual in nature – well, not obnoxiously sexual, it had me giggling to myself as I anticipated her next move. The restaurant was very colorful and there were signs everywhere. Perhaps one of the most unnerving was the bathroom marked “Hombres y Senoritas.” This consisted of 3 urinals and one toilet AND NO LOCK ON THE DOOR! A young lady was waiting for another restroom to vacate so she could lock the door. People sitting at the next table over told my date that they did not like what they ordered, but he did not know what it was. The restaurant features a Sunday brunch; Happy Hour twice a night – from 4:00-8:00pm and again from 10:30pm to 12:30am. All drinks are at 2 for 1 prices seven days a week. The noise was loud but as we walked along the street and checked out other restaurants on University they were as loud as ours. It is not a place to go for an intimate meal, but it is certainly worth the price for a casual encounter. 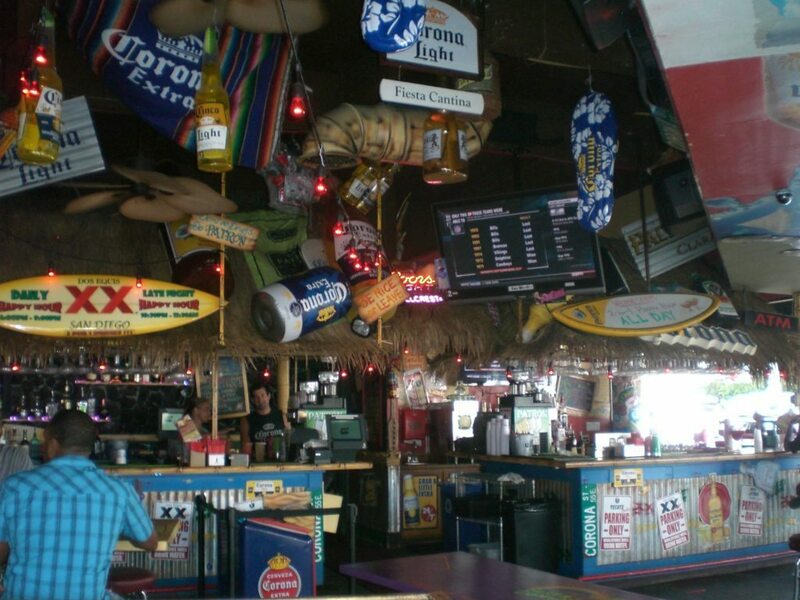 The owner of this place also owns the Cabo Cantina in PB. http://thecabocantina.com/. I live in HC and it’s ok but should you evern want to venture that way again for Mexi I would recommend Mama Testa’s. I totally agree. Mama Testa’s rocks! The Chorizo tacos are (hot!) really tasty. Thanks. Maybe I’ll have to ask a “date” out instead of waiting to be asked out.